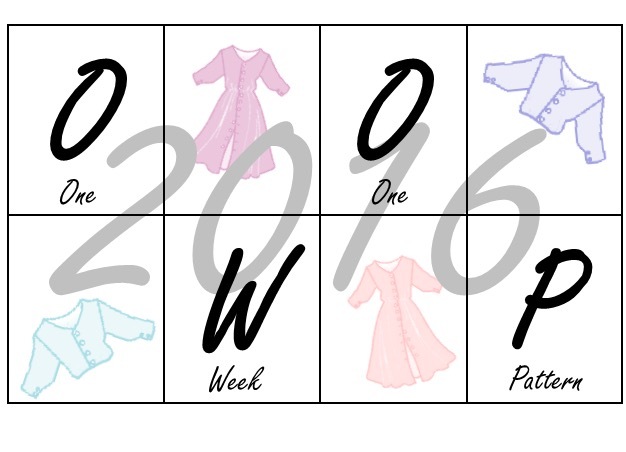 I haven’t sewn or blogged for a while. 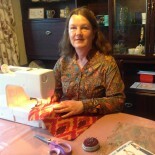 It’s not that I lost my sew-jo; more a case of losing my Mother. I did sew a very special dress for the funeral, but I’m not sure how comfortable people might be about a blog post about a dress for a funeral. Anyway, I should have been in Leeds today visiting my Father, but its snowing. Again. That’s the third visit I have had to postpone this winter. But it has given me a free Saturday to do some sewing. I have a few things lined up. V9022 was free with a recent issue of Love Sewing. The pattern says it is ‘very easy’. 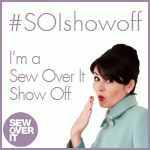 Agreed – the sewing itself is fairly easy, but the sizing and cutting out aren’t; particularly the cutting out. Several sewers comment about McCalls Company patterns having too much ease, and I have generally disagreed. This dress is described as fitted, so I thought I’d better measure me. Its very scary what the tape measure says. but the good news is that it appears to be lying! 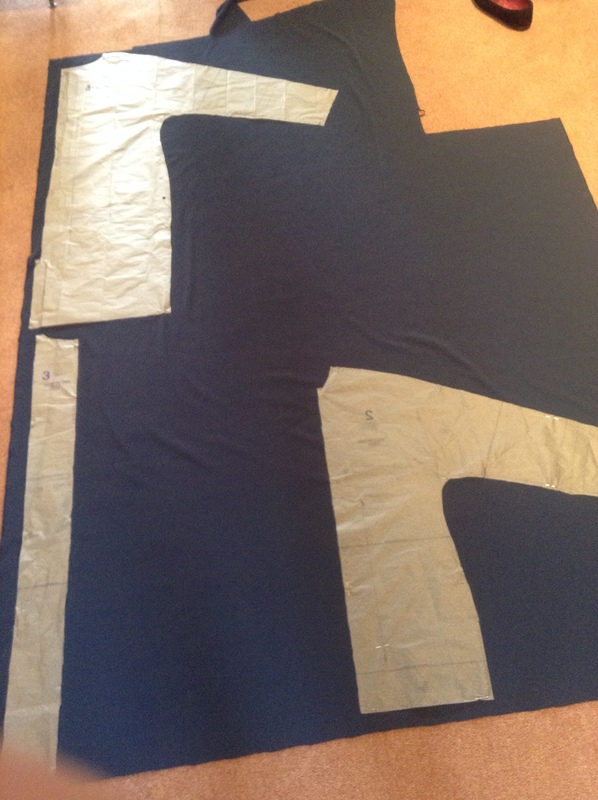 I cut the pattern slightly on the smaller side of my measurements, and then fitted to my dress form, and then me. Its not all that easy to paper fit to yourself without help. My general feeling was that the cut size was too big. So I went back to the size that I would have cut if I had not measured. Even that has quite a bit of ease, but too tight would have looked bad. the fabric kept sliding off the table and any pinned pattern pieces ripped. Not good. I cut out my first back piece, and then tried to lay out the second piece, to find that I had cut the first piece too high to fit in the second piece as per the suggested layout. Was this a disaster about to happen? Sadly, the only solution was to lay the fabric on the lounge carpet and see how I could remedy the problem without having to buy more fabric. I haven’t cut out on the floor since I was a teenager, and perfectly capable of crawling around and stretching. Actually, it wasn’t as hard as I thought it was going to be. Not only did I manage to work out a layout that got all of the remaining pieces out of the remaining fabric, but cutting might actually have been a bit easier than on a solid table top. Did I really say that?! The fabric is a crepe from Fancy Silk Store. They are my go-to shop for crepe as they have a good colour range. I chose the colour because it s a bit different. Its not grey and its not blue, although I did sew with blue thread. You might describe it as petrol colour, but then I pondered what colour petrol is, and quite honestly, I don’t know really! It generally flows seamlessly from pump to car without being seen. The photos don’t really flatter the dress. It looks better on me, but still looks slightly drab. So much for a different colour. So I brightened it up with my trade mark butterflies, of which I have a stock. But it is comfy to wear, which I what I had hoped. I nearly always have to shorten sleeves, but when I measured these from what I thought was the edge of the shoulder, they didn’t look as if they needed shortening. They did need shortening. I probably took off about 7 cm, which is about normal. But of course I had to cut it from the end of the sleeves rather from the shortening line because of my earlier mis-judgement. I can always add little cuffs if I don’t like the sleeve ends. My original main concern about the size was that it would be too long. It wasn’t, and I am only 163cm tall (apparently about average, but patterns are often aimed at taller people), and it was fine at knee length. I didn’t use a hook and eye at the back, as suggested by the pattern. I happened to find a small toggle button on the market which was just the right colour, so I joined that to a rouleaux loop. The dress goes over my head with the button fastened, so no need to ever undo what is now done! Will I make another? Probably not. The cutting out was a pain, and its a bit frumpy, but I have loved spending another day sewing, although to be honest, I’d rather have been in Leeds with my Dad. Thank you very much for your kind thoughts Janet. This entry was posted on March 18, 2018 by ann hebden in Dresses, Fashion, Handmade, Love Sewing, Sewing, Vogue, Vogue patterns and tagged Dresses, Handmade, Love Sewing, Sewing, Vogue, Vogue patterns.